In a typical bimodal approach, mode one largely seeks to bring down overall costs and is best suited to situations of predictable demand. This method is drawn along the concepts of efficiency, value-addition and waste reduction. The focus here is on retaining the traditional grind of business while maintaining the status quo. Driven by innovation, mode two focuses on agile and flexible solutions that employ strategies needed to delve into new markets and launch cutting-edge solutions. While mode one seeks to keep the balance, mode two focuses on how the supply chain adapts to new risks and opportunities. The basic premise of a bimodal supply chain is to innovate without giving up on conventional, tried-and-tested supply chain strategies of Material Requirements Planning (MRP) technique. As the cornerstone of operational excellence, conventional supply chains are best known for their efficiency and continually work toward lowering costs. Equipped to excel in coordinating supply and demand and supporting lean manufacturing philosophies, conventional supply chains work in the direction of optimizing costs without comprising efficiency. Aptly named Samurai, mode one is stable and therefore poses little to no risk in the entire supply chain management. With creativity at its helm, innovative supply chains adopt divergent thinking methods in order to support agility and flexibility. Although considered to be a riskier approach, it is best suited for impactful innovation. Primarily designed to support agility and innovation, this approach called Ninja is driven by advanced analytics, IoT, automation, and connectivity. 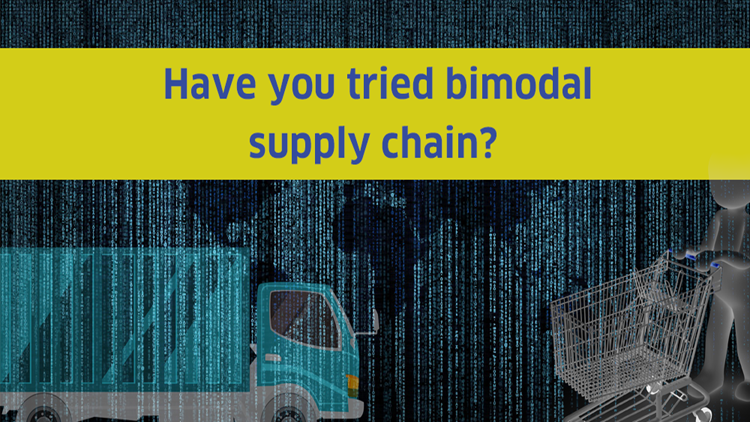 Gaining significant ground as a management strategy, the bimodal supply chain is becoming a guiding principle for companies like HP and Schneider Electric. Schneider Electric - the energy management company, through its bimodal supply chain approach sought innovation through a central transformation unit and continued improvement across its six regional centers. This bimodal structure helped Schneider in striking the right balance between having the supply chain operations remaining responsive to customer needs in their local geography, all along leveraging global scale in the transformation team. Supporting the traditional approach to management, the bimodal supply chain seeks to equip tomorrow’s leaders with the right strategy for carrying out data-driven business. The only prerequisite for thriving in a bimodal world is consistent innovation coupled with the ability to take risks and work around premeditated rules. While both modes are unique, they are also complementary and successful companies have learned to operate under both modes. While mode one is absolutely necessary in order to meet the customer demand, improve customer satisfaction and retain market share, mode two is the driver of innovation and progression. At times, one may lean more towards a particular mode than the other based on specific circumstances. On the whole, the bimodal supply chain is an interesting concept that is both hands-on and efficient. By promising to offer the best of both worlds, it supports complete adaptability to omnichannel strategies. Companies that implement bimodal supply chain will stand out by being agile, lean, efficient and innovative.